Due to their environmental impact, cities play a crucial role in the transition towards sustainable societies. Despite the fact that they occupy only 3% of the global terrestrial surface, cities house more than half of the world’s population, consume 7% of its natural resources and are directly and indirectly responsible for 60 to 80% of global greenhouse gas emissions (UNEP, 2012). The urban environment thus acts as a nexus of material flows and nodes for energy, water, consumption and production. Cities are key leverage points that demand our focus if we are to accelerate the necessary transition to circular and sustainable systems, both locally and globally. Learn how to connect urban material, water, and energy flows to build a truly sustainable city. 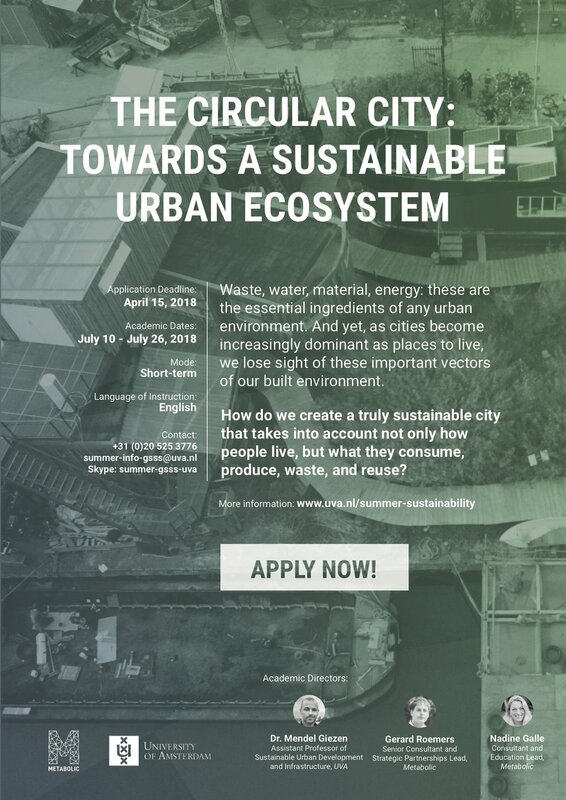 This programme is developed in collaboration with Metabolic, a consulting and venture building company that uses systems thinking to tackle major sustainability challenges.